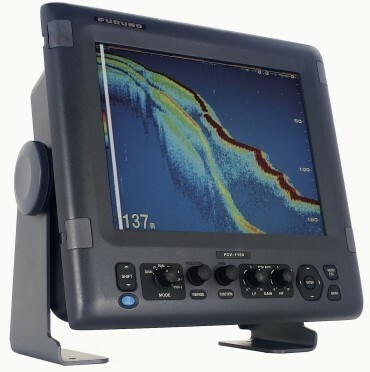 A fishfinder is a specialized type active SONAR used to detect fish at various depths and show the contour of 'the bottom'. The device displays the findings LCD or CRT screen, sometimes in combination with a chartplotter. Unless you have been fishing in the same spots for years, fishfinders help you catch fish. Some are so powerful that you can see the fish and your bait hook. Fishfinders come in all sizes, shapes and features. For very serious fisherman, they are often a standalone unit, like the one pictured above. Pleasure boaters often buy a combination fishfinder & chartplotter. This system has a GPS, Charplotting Software, a Transducer for the Sonar and Fishfinding display. Generally, the display splits to show where you are at and what is underneath. We offer premier systems from all the manufacturers. Picking the right one for your application can be tricky, so if you don't know what you need, let our marine online techs help you pick the right one for your boat. years, fishfinders help you catch fish. Some are so powerful that you can see the fish and your bait hook. Fishfinders come in all sizes, shapes and features. For very serious fisherman, they are often a standalone unit, like the one pictured above. Contact us today for a free consultation! Marine Fishfinders All Brands Rugged and reliable, Fishfinders are essential to catching fish these days. Without, the guy in the next boat just caught you fish. We offer Fishfinders from the premier providers Current Indicators Furuno Fishfinders Garmin Fishfinders ICOM Marine Fishfinders JRC Fishfinders Kodan Fishfinders Net Sounders Lowrance Fishfinders Raymarine Fishfinders Si-Tex Fishfinders SIMRAD Fishfinders SONAR Standard Horizon Fish Finders Transducers All Products Index in Alphabetical Order Pleasure boaters often buy a combination fishfinder & chartplotter. This system has a GPS, Charplotting Software, a Transducer for the Sonar and Fishfinding display. Generally, the display splits to show where you are at and what is underneath. We offer premier systems from all the manufacturers. Picking the right one for your application can be tricky, so if you don't know what you need, let our marine online techs help you pick the right one for your boat.